Did you know that pioneer women sewed lead in their hems to keep their dresses from billowing on the trail? Or that hatless men had to wear bonnets to protect their eyes from the scorching sun? 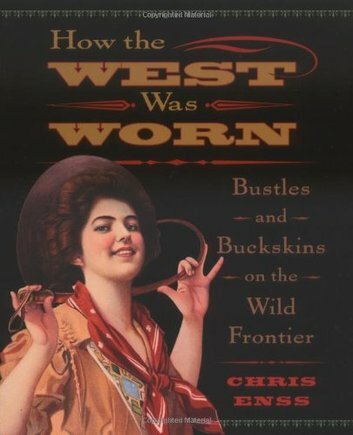 From old familiar Levi's to the short-lived "instant dress elevator," How the West Was Worn examines the sometimes bizarre, often beautiful, and highly inventive clothing of the Old West. You'll learn how a cowboy's home state determined the way he wore his pants and hat, as well as how to distinguish one Indian tribe from another by their moccasins. Meet John B. Stetson, leading maker of cowboy hats; Adah Menken, whose flesh-colored nylon costume left an audience gaping at her underwear; and Amelia Jenks Bloomer, promoter of you guessed it, the bloomer. Paperback, c2005, 144 p. : ill. ; 19 cm.